The patterns on this sampler are found on clothing. The V-shapes (lower right) show how to work a pattern at the bottom of a neck slit opening. From this an embroidered medallion was sometimes suspended, and this sampler provides two examples of diamond-shapes with tiny hooks along the edges for an embroiderer to copy. The two diagonal bands with S- and Z-shapes repeated along their length (lower left) are models for diagonal stripes; the Newberry collection contains two fragments of trouser cuffs worked with comparable ones. The blue straight narrow band (lower right) is typical of those found on tunics; two design elements alternate to form a pattern enclosed by parallel lines of stitching. 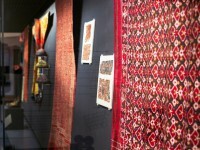 Sometimes similar parallel lines enclose panels of decoration as seen on a child 's tunic, illustration No. 17 [EA1984.353]. The word "Fustat" and the date 14.7. ('32) are written on the back of the embroidery so this is presumably where and when Professor Newberry acquired it. His wife wrote that many items were added to the collection in the 1930s from rubbish heaps in the area of Fustat, in the southern quarter of present day Cairo. 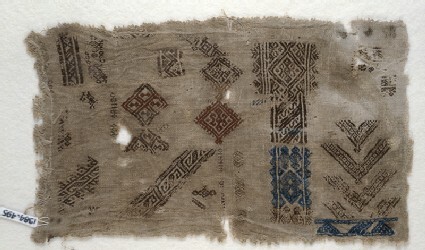 A sampler fragment with rectangles, bands, and diamonds, as well as chevrons, all filled with hook motifs, S-shapes, or small diamonds. The sampler has been radiocarbon dated to 1281 AD +/- 35.